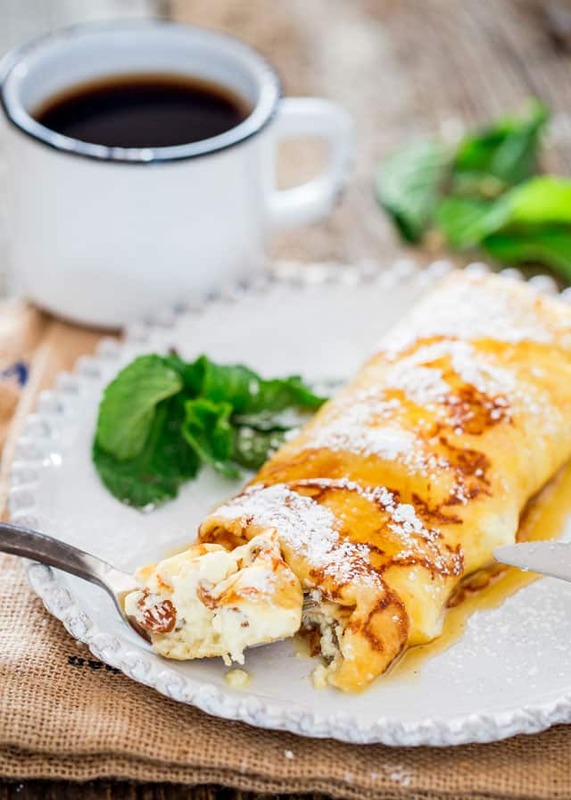 Maple Ricotta Stuffed Crepes – Tender and delicious crepes filled with a ricotta cheese and raisin filling, baked then topped with maple syrup. 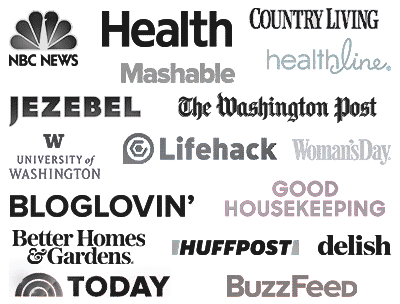 Make your next at-home-brunch the best one yet! 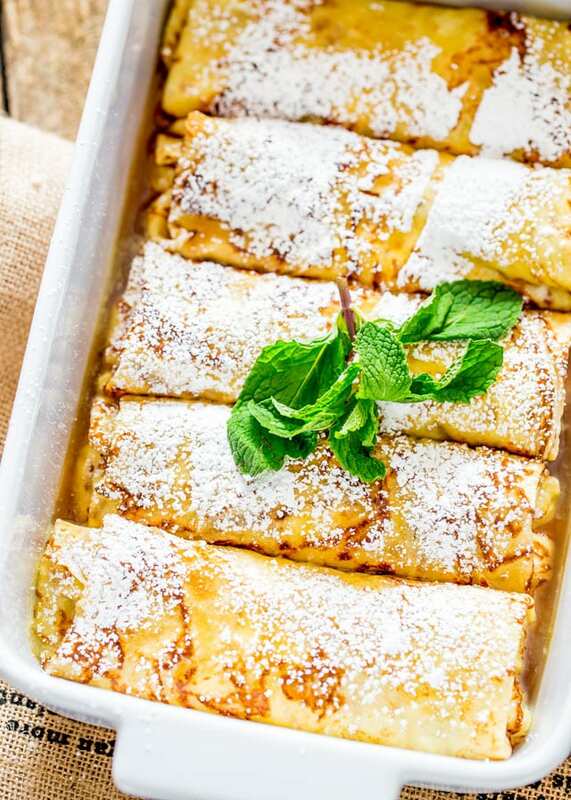 These stuffed crepes are fluffy little pillows full of creamy goodness that will keep you coming back for more. This is my Canadian/Romanian take on my favorite dessert. The maple syrup makes it Canadian, in case you’re wondering, and the rest is Romanian, simply because it’s a dessert I grew up with. That’s my reason and I’m sticking with it. I have to admit that over the past couple months I’ve been making lots of crepes, I go through these phases every few years or so where I make crepes all the time, then nothing for another couple years. 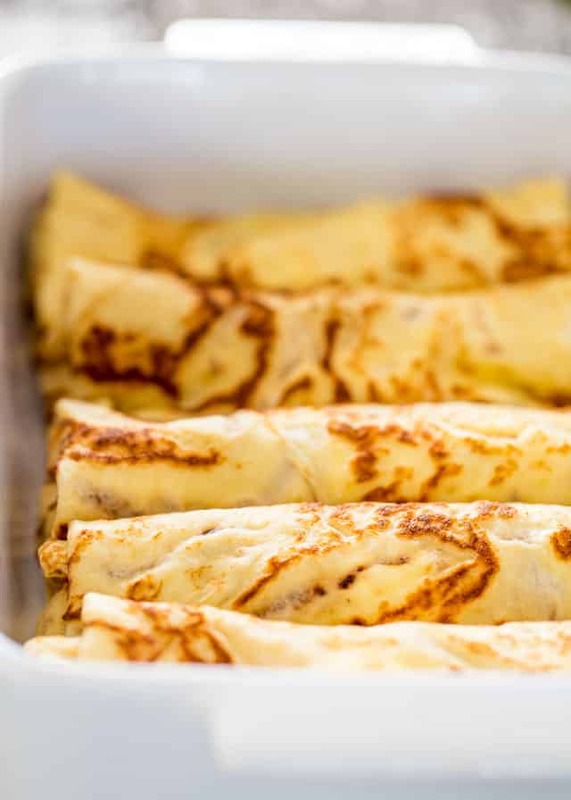 Normally we eat them with Nutella or just jam, but every once in a while I like to make something a little bit special like these ricotta stuffed crepes, and they are so delicious. I actually wanted to bake these for a bit, only 10 minutes, just enough time for the outside to crisp up a bit, then while they’re hot pour some good maple syrup all over them, dust them with some icing sugar and you’re good to go. You could also serve this alongside a scoop of ice cream, if you so desire, but for me there’s enough sweetness from the maple syrup. While I always serve this as a dessert, you could also have this for breakfast, however if I were to serve crepes for breakfast I’d probably stuff them with something more savory like ham and cheese or something. After all these years of making crepes, I still haven’t made a savory crepe. 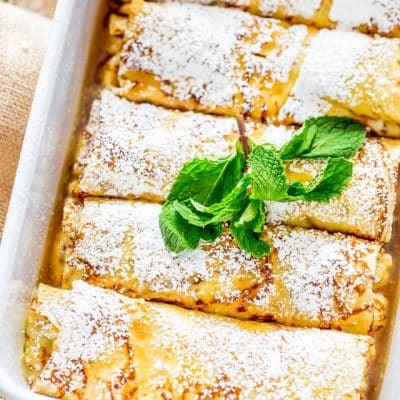 I don’t know why, probably because for me crepes were always a dessert, but that doesn’t mean that I wouldn’t enjoy a savory crepe, I probably would and love it. One thing to note here is that I only made 5 crepes because that’s all I could fit in my 7×11 inch casserole dish, but you could use a 9×13 and just make more crepes, in a 9×13 you could probably fit 6 to 8 crepes, but you’ll need a bit more filling too. If you love this recipe, try my Nutella Berry Crepes! Watch the video and see just how easy this is to make your own crepes! 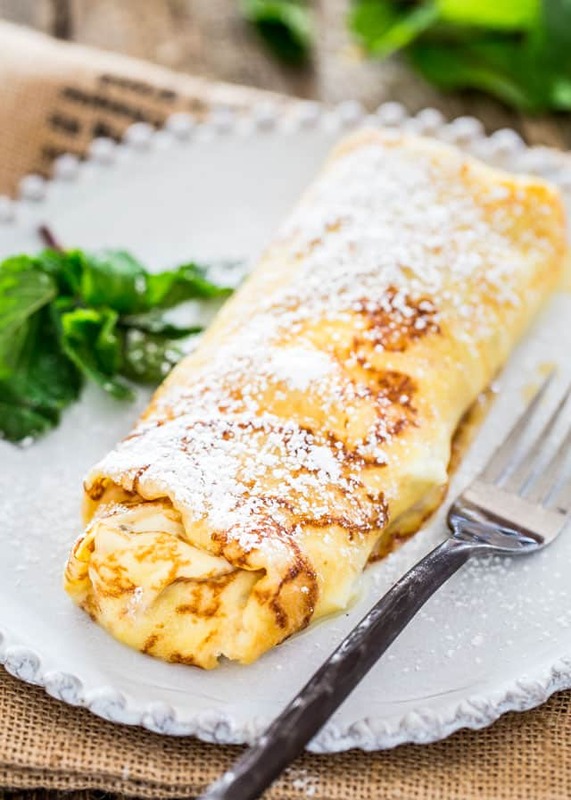 Maple Ricotta Stuffed Crepes - Tender and delicious crepes filled with a ricotta cheese and raisin filling, baked then topped with maple syrup. Preheat oven to 375 F degrees. Lightly grease a casserole dish with cooking spray (my dish is 7x11 inches). In a medium size bowl stir together the ricotta cheese, sugar, egg and raisins. Fill each crepe with 1/5 of the filling, about 3 tbsp, then fold the crepe like an envelope. Place the crepes in the prepared casserole dish and bake for 10 minutes. Remove the casserole dish from the oven and drizzle maple syrup over the crepes then dust with icing sugar if preferred. For the recipe for crepes, click here. If you don't like raisins, you can try dried cranberries, chopped dried figs or apricots, pecans, walnuts, etc. ce e aia riccota chese ? Branza de vaci ? E ca un fel de branza dulce, dar trebuie sa gasesti si ricotta acolo. Oricum si branza dulce merge la clatite. My patience has paid off! I am looking forward to my sweet reward with fork in hand! I don’t eat raisins; I had a Grandmother who loved to tease me that her raisin jar was actually dead flies. Have never been able to look at a raisin without seeing a thousand fly eyes looking back at me…so, I’m going to use Craisins. I love the tart flavor of cranberries and so I think will go well with this recipe. I have a cousin visiting me from Edmonton (I know about the Edmonton/Calgary thingy) and I will prepare these for her one day next month when she is here. It should be a great adventure to have a house guest whom I have never before met! Long live the Romanian clatita, even in this fresh variant with an Italian/Canadian flavor. 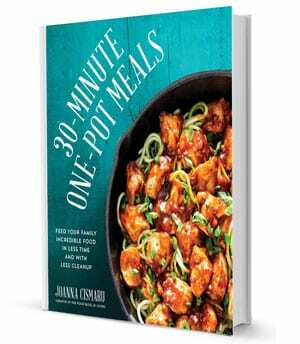 Thank you for another delicious recipe Jo! We’ll have to try it this weekend. Looks so good…and your pictures are amazing! I think I am in love! I’ve made crepes with various fillings, toppings or changed the batter mix but never ever had I thought of putting them in the oven! I think I am going back to the kitchen as I am craving these so much! BTW savoury crepes are delicious. Try adding some garlic and herbs in the batter! Oh my yum! I would eat the whole pan!